MONTICELLO, AR (April 25, 2017) -– Over 350 anglers from 20 states competed in the 7th Annual SeaArk Boats Owner’s Invitational held last weekend on the waters of Lake Wheeler in Decatur, AL. Anglers from across the Mississippi River Valley, Appalachia, and the Southeast competed for over $73,000 in cash and prizes, including a chance to win a SeaArk ProCat 200 with a Suzuki DF200ATX and B&M HaulRite Trailer, valued at $38,750. Activities began Friday night with check-in and late registration during the Captain’s Dinner at Ingalls Harbor Pavilion. Participants were treated to a dinner catered by Big Bob Gibson’s BBQ while the SeaArk Tournament Committee reviewed the rules and answered any last-minute questions. Saturday’s main event began with a 6:30AM blast-off indicating the start of the tournament. Final weigh-in was held at 3:30PM at the Ingalls Harbor boat ramp in front of a crowd of over 400 people including SeaArk Pro Staff, fishermen, and local spectators. 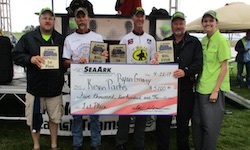 The team of Kevin Parks from LeRoy, KS and Ryan Gnagy from Milford, KS took the first-place check for $5200 with 188.97 pounds. Jim Loudermilk of Hamilton, OH and Steve Jones of Seven Mile, OH snagged second place with a weight of 142.57 pounds for a take home of $2700. Third place went to David Shipman and Brooke Wilbanks of Corinth, MS who finished with 5 fish weighing in at 139.64 pounds. Big Fish winners were also Kevin Parks and Ryan Gnagy who caught a blue cat weighing in at 82.49 pounds to win an extra $2000. Winners of the prize drawing for the SeaArk ProCat 200 package were Kellie and Richard Morris of Trinity, TX. The SeaArk Tournament Committee weighed-in 312 catfish totaling 5,264 pounds. Sponsors for the event include Suzuki Marine, B&M HaulRite, Whisker Seeker Tackle, Line-X, Monsters on the Ohio, and Wise Company.